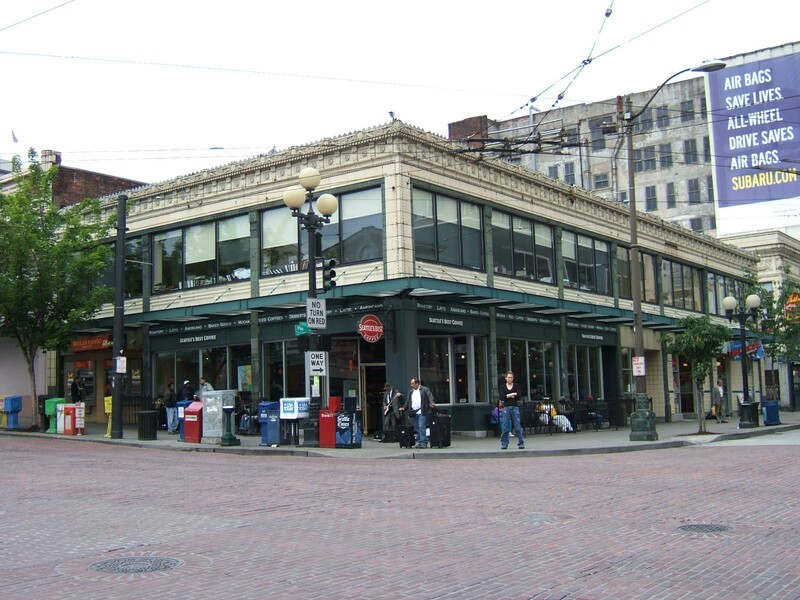 Prominently located at the NE corner of First Avenue and Pike Street, this two-story commercial block continues to house retail and office uses. It measures 57’ x 111’ and exhibits classically-derived architectural ornament. The reinforced concrete structure is clad with ornate speckled cream-color (and green) glazed terra cotta and is further distinguished by an ornate terra cotta crested cornice and enframed window surrounds and trim at the 2nd floor level. The two-part commercial block façade is divided by green terra cotta clad pilasters into three bays on First Avenue and six bays on Pike Street. All of the original metal (copper?) upper floor level spandrel panels remain in place but have been painted. All of the original wooden windows have been replaced by a modern aluminum window product. The entire storefront level (with the exception of the structural/terra cotta clad pilasters) has been reconstructed with modern aluminum window and door assemblies. An original entry marquee at First Avenue has been removed and a modern steel and glass canopy has been installed along the entire storefront at both elevations. There do not appear to be any intact or architecturally significant interior building features, finishes or public spaces. Krafft, Katheryn H. "News Lane Block Report - Cultural Resource inventory Form," prepared 1995.